Everyone talks about exfoliating, but, whether they do it or not is another story. For many people, the most important skincare step is removing makeup, but what about removing the dead skin cells and dirt that’s setting up camp on your face? Exfoliating isn’t as black and white as it may seem. Exfoliating comes in two categories, physical and chemical, and while they act on doing the same thing (removing dead skin cells), the way they do it is very different. If you find yourself questioning which is right for you, then you’ve come to the right place. Wonder no more whether you should be scrubbing or using peels, because the categories of exfoliation are about to become your specialised subject! The best way to recognise if something is a physical exfoliant is to ask yourself if you need to physically work it into the skin. If the answer is yes, then you have your answer! Usually made up of grainy particles, physical exfoliants work on the surface to remove dead skin cells, helping to promote cell turn over and leave your complexion feeling super-fresh. 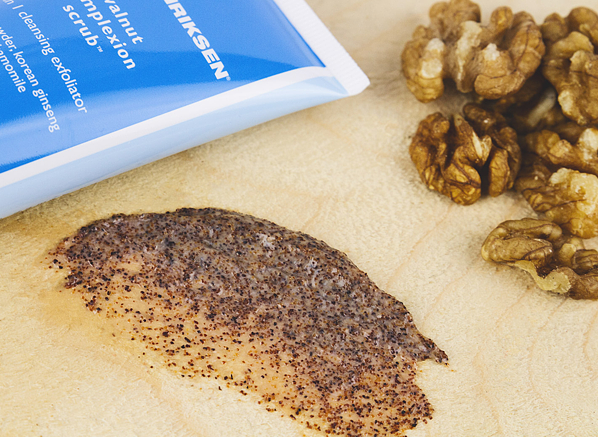 The Ole Henriksen Walnut Complexion Scrub is the perfect example of a physical exfoliant, powered by the mild abrasive power of walnut powder. Physical exfoliators can be used by a number of different skin types, there are just a few things you’ll need to consider before you start scrubbing. • Do you have sensitive skin? If yes, maybe sit this one out and skip to chemical exfoliators, the grainy particles may irritate your skin and do more harm than good. • Do you have acne? Chemical exfoliants may be a better choice for you, you don’t want to cause any more redness or irritation to your skin. If you answered no to both the above questions then physical exfoliants may be your skin’s new best friend. Oily and blemish-prone skin types will see major benefits from physical exfoliants as they’ll help to unclog pores and rid the skin of dirt and excess oil. The recommended usage for many exfoliators is 3 times a week. But, the real answer to this question lies within your skin. Those with super-oily complexions may see the benefits of increasing this to 4 times a week whereas combination skin types may irritate their skin by doing this. And, sorry to throw a curve ball in but over-exfoliating can be just as bad as not exfoliating at all. Over-scrubbing will leave your skin vulnerable as it exfoliates away the healthy skin cells that protect your skin’s natural barrier. Shininess, breakouts and puffiness are signs you’ve over done it, so if you notice any of these give your skin a rest and think about cutting your exfoliating routine down to 1-2 times a week. Opposite to physical exfoliators, chemical exfoliators don’t need to be worked into the skin. Made up of different chemicals that work to break down dead skin cells and impurities, chemical exfoliants are what I like to refer to as ‘invisible exfoliators’. There are two types of these invisible exfoliants, AHA’s (alpha-hydroxy acids) the most common being glycolic and lactic and BHA’s (beta-hydroxy acids), which specifically refers to salicylic acid. • AHA’s – Glycolic Acid and Lactic Acid: These tiny molecules penetrate the upper layer of the skin and dissolve dead skin cells and promote cell regeneration. Glycolic Acid is the stronger of the two but both are commonly used in chemical exfoliants. 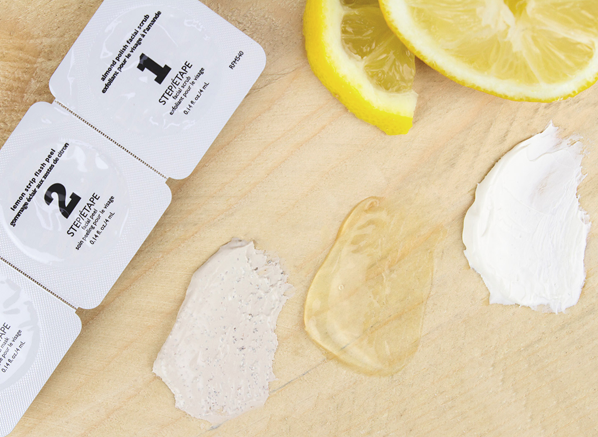 If you want to find an exfoliator with both the Ole Henriksen Lemon Strip Flash Peel is the perfect candidate. • BHA’s – Salicylic Acid: This acid will do the same thing as AHA’s and more. Not only can it penetrate the upper layers of the skin but it can penetrate and unclog pores (if this sounds up your street check out the Vichy Normaderm Purifying Pore-Tightening Toning Lotion), salicylic acid is also anti-inflammatory and anti-irritant, perfect for those with acne-prone skin. As I mentioned above, chemical exfoliators are a great choice if you have acne as they work deep down to remove dirt and impurites. Chemical exfoliators are also a great option for those with sensitive skin as you won’t get the harsh abrasive action you would with a physical exfoliant, however I would suggest patch tests if your skin is super sensitive. Ageing skin will also benefit from using chemical exfoliants as the acids will help to smooth fine lines and wrinkles. The strength of the chemical exfoliator you choose will distinguish how many times a week you’ll use it. Over-using chemical exfoliators with high quantities of AHA’s and BHA’s may prove to be redundant and harmful to your skin so bear in mind their strength when you’re planning your exfoliating rota. When should I use a chemical and a physical exfoliator? Any skin type could switch back and forth from chemical and physical exfoliators but there’s one skin type that’ll benefit from using them both the most, and that is ageing skin. Physical exfoliators will help increase micro-circultation and a chemical exfoliator will penetrate deep down to smooth fine lines. 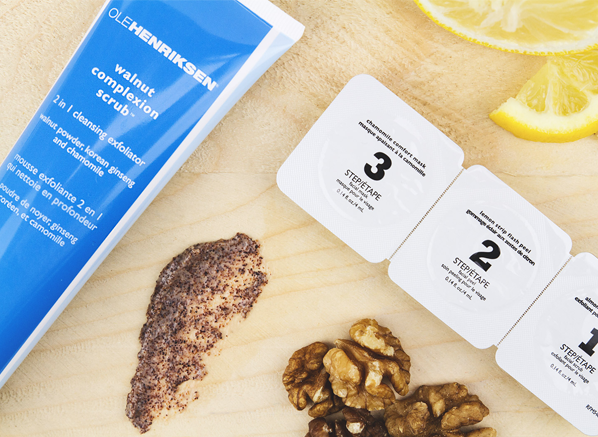 The Ole Henriksen Power Peel Pods kit is the ideal way to factor chemical and physical exfoliants in to your routine, comprising of a 3-step system that works on the skin’s upper and lower layers. Still need a little help finding the exfoliator perfect for you? Leave a comment down below or tweet us @escentual! This entry was posted on Thursday, February 18th, 2016 at 3:03 pm and is filed under Skincare. You can follow any responses to this entry through the RSS 2.0 feed. You can skip to the end and leave a response. Pinging is currently not allowed.